It’s one thing to create an app designed to engage your consumers. It’s another thing to receive validation that you’ve done it right. 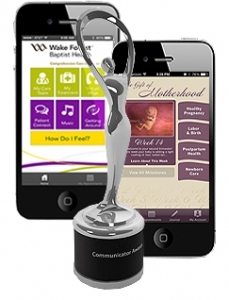 That’s just what happened for two healthcare organizations last week, as Wake Forest Baptist Health’s (WFBH) Comprehensive Cancer Center and Customized Communications’ The Gift of Motherhood received 2014 Communicator Awards of Distinction. These award-winning health apps, both built on the MobileSmith platform, contain some of the best traits organizations should emulate when they develop an engaging mobile experience for customers. In such a tumultuous time for the patient, this app serves to streamline patient care. It allows the patient to organize all their specialists in one feature and enables patients to keep track of their many appointments and medications, as well as receive reminders for both of them. Making a necessary task easier for the consumer, will help ensure your app’s success. In addition to the aforementioned features, the app provides a Virtual Wig feature where patients can try out different hairstyles. Further the app provides a music function, for patients to entertain themselves and a map for easy navigation around the campus. Engaging consumers on multiple levels is a great way to ensure that your app is kept. The app has a lot of features, yet they are all neatly organized on the front page, enabling a quick, easy user experience. It doesn’t look messy, and the patient doesn’t have continuously tap to find what they want. Time is precious, both in life and business, so saving your users time is essential for app success. Whenever an expectant mother has a pregnancy question, she can simply turn to the app. There’s no need for computers or Google searches, the information is right there on her mobile device. If you are able to put essential information in the hands of your consumers, they will see your app, like these award-winning health apps, as essential tools on their mobile device.. Marketed to healthcare providers as a tool to prescribe to expectant mothers, the app provides a means for physician-mother interaction through push notifications. 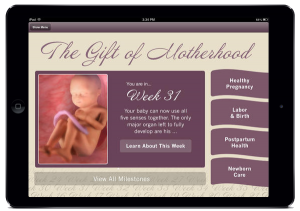 Further, with appointment reminders, 3-D videos, and a birth calendar and journal, the Gift of Motherhood provides something engaging for the mother to do, every time she opens the app. Interacting with your user, and keeping them involved is the best way to ensure they keep coming back. The Gift of Motherhood is available for iPhone, Android and iPad, so users on almost any mobile device will be able to utilize this resource. Further the app is optimized so the content is efficiently displayed no matter the screen size. This allows the app to reach more users and expand the brand awareness of Customized Communications. If you make your app available for multiple devices and design it effectively for them, then you have a much easier path to gaining users. These two organizations recognized the necessity of reaching customers on their mobile devices, and created useful, engaging apps, setting themselves up for long-term success. Any company, in implementing a mobile strategy, should strive to follow their example. With the MobileSmith platform, businesses can easily create award-winning apps, without any programming. Using the basic strategies that Wake Forest Baptist Health and Customized Communications implemented, your organization can engage your customers most effectively, and may just take home some hardware along with it.